Dr. Calvin Mackie, right, and STEM NOLA students. NEW ORLEANS, LA – PowerMoves.NOLA alumni and New Orleans Startup Fund portfolio company STEM NOLA was recently awarded a $140,000 W.K. Kellogg grant. The one-year grant will go towards developing an online resource and training platform for pre-kindergarten through second-grade educators. Read the full article here. The New Orleans Startup Fund (“The Startup Fund” or “NOSF”) is a non-profit 501(c)(3) evergreen seed fund established by business and financial leaders in the Greater New Orleans area, and originally incubated by Greater New Orleans, Inc., to accelerate the growth of early-stage, innovative businesses into venture-ready companies. The Startup Fund’s mission is to create jobs and economic prosperity for the 10-parish Greater New Orleans region by providing seed capital and business assistance to early-stage firms that demonstrate significant growth potential. 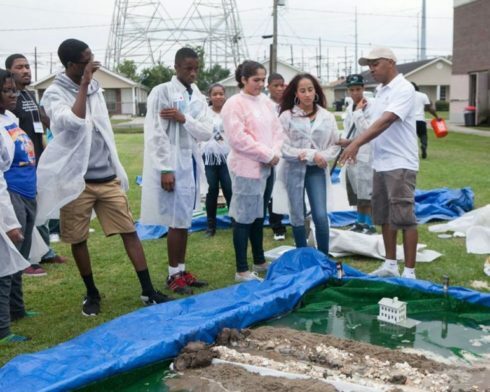 STEM NOLA (SN) is an organization founded by New Orleans native, and former tenured Tulane University Engineering professor, Dr. Calvin Mackie. The purpose of its existence is to expose, inspire and engage members in the surrounding communities about the opportunities in Science, Technology, Engineering and Mathematics (STEM).